Scientific mistakes are no sin, but it would be a mistake to think there is no ethical dimension to the theory of evolution. The ethical aspects of evolution are most obvious in its misrepresentation of science. Even evolutionists agree scientists are responsible for the accurate transmission of scientific knowledge to the public. And yet evolutionists consistently misrepresent science, claiming evolution is an undeniable fact. It would be irrational, they say, to think otherwise. What is striking is the degree of this misrepresentation. We’re not talking about a minor mistake or two that led to an error in the third decimal point. We’re not talking about a subtle blunder that could easily go undetected. Consider, for example, the evolution of the synapse. In my previous post I discussed the brain and an evolutionist wrote to me about this paper. Does it not reveal solid hypotheses for the evolution of the brain’s circuitry? Before we answer this question we need briefly to review the biology involved. Our nervous systems contains a great many nerve cells, or neurons. Like wires in a machine, neurons carry electrical signals. And just as wires pass electricity to other wires, so too neurons pass their electrical signals to other neurons. Also, just as wires ultimately connect to a motor, or a sensor, or some other device, neurons ultimately connect not to another neuron, but to tissue. But this is where the similarity ends. The closer we look at neurons and their connections, the more profound are the discoveries we make. So first let’s review how the signal travels down the neuron and how it is transmitted. Nerve cells have a long tail which carries an electronic impulse, called an action potential. The tail can be several feet long and its signal might be passed to another neuron, stimulate a muscle to action, control a gland, or report a sensation to the brain. Like a cable containing thousands of different telephone wires, nerve cells are often bundled together to form a nerve. Early researchers considered that perhaps the electronic impulse traveled along the nerve cell tail like electricity in a wire. But they soon realized that the signal in nerve cells is too weak to travel very far. The nerve cell would need to boost the signal along the way for it to travel along the tail. After years of research it was discovered that the signal is boosted by membrane proteins. First, there is a membrane protein that simultaneously pumps potassium ions into the cell and sodium ions out of the cell. This sets up a chemical gradient across the membrane. There is more potassium inside the cell than outside, and there is more sodium outside than inside. Also, there are more negatively charged ions inside the cell so there is a voltage drop (50-100 millivolt) across the membrane. In addition to the sodium-potassium pump, there are also sodium channels and potassium channels. These membrane proteins allow sodium and potassium, respectively, to pass through the membrane. They are normally closed, but when the action potential travels along the nerve cell tail, it causes the voltage-controlled sodium channels to open quickly. Sodium ions outside the cell then come streaming into the cell down the electro-chemical gradient. As a result the voltage drop is reversed and the decaying electronic impulse, which caused the sodium channels to open, is boosted as it continues on its way along the nerve cell tail. When the voltage goes from negative to positive inside the cell, the sodium channels slowly close and the potassium channels open. Hence the sodium channels are open only momentarily, and now with the potassium channels open, the potassium ions concentrated inside the cell come streaming out down their electro-chemical gradient. As a result the original voltage drop is reestablished. This process repeats itself until the impulse finally reaches the end of the nerve cell tail. Although we’ve left out many details, it should be obvious that the process depends on the intricate workings of the three membrane proteins. The sodium-potassium pump helps set up the electro-chemical gradient, the electronic impulse is strong enough to activate the sodium channel, and then the sodium and potassium channels open and close with precise timing. How, for example, are the channels designed to be ion-selective? Sodium is about 40% smaller than potassium so the sodium channel can exclude potassium if it is just big enough for sodium. Random mutations must have struck on an amino acid sequence that would fold up just right to provide the right channel size. That is an astronomical long shot. The potassium channel, on the other hand is large enough for both potassium, and sodium, yet it is highly efficient. It somehow excludes sodium almost perfectly (the potassium to sodium ratio is about 10000), yet allows potassium to pass through almost as if there were nothing in the way. The solution seems to be in the particular amino acids that line the channel and their precise orientation. For potassium, moving through the channel is as easy as moving through water, but sodium rattles around—it fits in the channel but it makes less favorable interactions with the amino acids. Again, the amino acid sequence of the potassium channel is fine-tuned for the job. Next, when the action potential reaches the end of the neuron it is passed on. First, the action potential causes voltage-controlled calcium channels, located at the end of the tail, to open. Positive calcium ions on the outside stream into the neuron through the open channels. The calcium ions influence special proteins just inside the neuron, which in turn cause small bubbles to dock with the cell membrane. The bubbles contain a neurotransmitter chemical which is released to the outside of the cell. The human brain is truly awesome. A typical, healthy one houses some 200 billion nerve cells, which are connected to one another via hundreds of trillions of synapses. Each synapse functions like a microprocessor, and tens of thousands of them can connect a single neuron to other nerve cells. In the cerebral cortex alone, there are roughly 125 trillion synapses, which is about how many stars fill 1,500 Milky Way galaxies. One synapse, by itself, is more like a microprocessor—with both memory-storage and information-processing elements—than a mere on/off switch. In fact, one synapse may contain on the order of 1,000 molecular-scale switches. A single human brain has more switches than all the computers and routers and Internet connections on Earth. It is conceivable that the first protein–protein interaction that led to synaptogenesis would be homophilic. Cadherins may therefore be important for cytoskeletal rearrangement in choanoflagellates and may represent a precursor to synapse formation. heterophilic transynaptic protein interactions probably evolved later. … implying that they may form a protosynaptic complex involved in sensing environmental stimuli and that they could represent an evolutionary precursor to synaptic sites. But this is only the beginning. In fact nowhere does the paper explain in scientific detail how the synapse and associated machinery could have arisen on its own. How did the massive protein machines, with their intricate and fine-tuned functions arise? How did evolution establish the right ionic concentrations inside and outside of the cell? 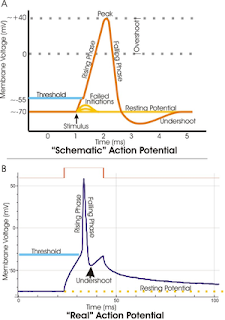 How did the finely-tuned action potential initiation and transmission mechanisms evolve? How did the neurotransmitter chemical concentrations, complete with bubbles and associated proteins arise? And none of this would function without the finely-tuned receptors on the receiving cell. It also would not function without the right mechanisms for replenishing the neurotransmitter chemical, as well as the calcium, potassium and sodium concentrations. And how did evolution bundle the neurons, and connect them to the right receptors, implementing trillions of synapses. How did evolution provide both memory-storage and information-processing elements to the synapse? Similarly, the reader learns that this protosynapse consists of “synaptic components that were present before the emergence of synapses.” Were present? It is remarkable that evolutionists can know such details. In general terms, the evolution of synaptic genes at the eukaryote–metazoan and metazoan–chordate boundaries preceded their expression in different populations of neurons and synapses and thereby allowed diversity of function in nervous systems that have emerged later, in evolutionary terms, and that are generally larger. Again, these evolutionary conclusions are amazing. What powerful scientific methods do evolutionists possess that can yield such detail and certainty? If we can deduce the composition of the last common ancestor of all synapses, the ursynapse, then we should be in a position to address the question of how and why the first synapse originated. We approach the question of the composition of the ursynapse by taking synaptic proteins identified in vertebrate model organisms and searching for orthologues in the genomes of two categories of organism. Searching for orthologues? That may sound sophisticated, but it amounts to nothing more than searching for similar genes in different species. That’s it. Evolutionists search for these and other genetic similarities, and from those make sweeping conclusions and present them as new truths. One of the ever-present themes in the evolution genre is that similarity mandates evolutionary relationship. If two species share a common design, such as similar genes, it must have arisen from a common ancestor. This is not a scientific premise, and it is an example of how metaphysics makes its way into science under the guise of the scientific method. Searching for orthologues certainly sounds scientific. But in the hands of evolutionists it is religiously-driven science. Evolutionists insist that evolution is a scientific fact every bit as much as is gravity or the roundness of the earth. That is a misrepresentation of science that goes far beyond a simple mistake. For centuries evolutionary thinkers have issued unlikely speculation as undeniable truth, and the gap is only becoming wider. Today, the certainty they insist upon is prima facie absurd. Evolution has degraded to a religiously-driven junk science making, what are frankly, silly claims. But the manipulation of science is no joke. Misleading the public with inexcusable misrepresentations is a serious breach of ethics. Religion drives science, and it matters. Speaking about an egregious breach of ethics, did you hear about how the Discovery Institute was caught lying in the sham lawsuit they filed against the California Science Center and California Science Center Foundation? "Again, these evolutionary conclusions are amazing. What powerful scientific methods do evolutionists possess that can yield such detail and certainty?" Homology search. It's a rigorous method used for practical everyday research across every scientific field using bioinformatics. Why should the evolutionists not be allowed to use it? You are basically arguing that an utterly standard and incredibly useful method (and experimentally and statistically verified umpteen times over) amounts to *lying* when evolutionists use it. This is crazy, unfair, hackery. The protein structures that you creationists ignorantly, naively *assume* had to be "designed" specifically for synapse function, are in fact widespread and have functions even in critters that don't even have multicellularity, much less neurons. Thus, it is *proven* that everything didn't have to evolve at once (which would indeed be improbable). Homology search. It's a rigorous method used for practical everyday research across every scientific field using bioinformatics. Sequence search and alignment establishes the degree of similarity between different sequences. And of course it can be expressed with various statistical scores. You use the term "homology search" and the distinction is important. For the benefit of readers, the term "homology" these days is used to indicate an evolutionary relationship. Two structures, in different species, are "homologous" if they arose from a common ancestor. So when you and evolutionists use the term "homology search," you are implicitly relying on the premise that similarities (sequence similarity in this case) imply common descent and therefore homology. So your claim that homology search is the powerful method evolutionists use to arrive at their fantastic conclusions, while true, simply reinforces the point made in the OP. The premise that similarities imply common descent is an evolutionary (and metaphysical) premise. Why should the evolutionists not be allowed to use it? They should be allowed to use it. But they should not misrepresent the results as a scientific finding of evolutionary relationship. Given the premise then, yes, the evolutionary claims are perfectly valid. But the premises need to be aired out for all to see. You are basically arguing that an utterly standard and incredibly useful method (and experimentally and statistically verified umpteen times over) amounts to *lying* when evolutionists use it. This is crazy, unfair, hackery. No, I'm arguing the *interpretation* of the results of this method as unequivocal findings of evolutionary relationships, without exposing the underlying metaphysical premises, is a misrepresentation. But I don't assume that. It's pretty amusing that Cornelius here gets so confused about what a paper with the title "On the origin and evolution of the synapse" is actually about. Indeed, he spends multiple paragraphs describing how an impulse is transmitted down a nerve cell, but then glosses over what actually happens at the synapse. He then demands that the authors provide a complete account of the evolution of a nerve. Of course, what good is a synapse without a nerve? That is exactly the question the authors address. But Cornelius is too wrapped up in his pet idea (accepted by precisely no one, except perhaps his mom, and for good reason) that basic evolutionary logic is metaphysical to get this. Here is the logic: There are two explanations for why two separate species share a similar gene: 1) Common ancestry (they inherited it from a common ancestor) 2) Separate ancestry (they obtained it separately through e.g. convergence or lateral gene transfer). Contrary to what Cornelius says, there are multiple methods of distinguishing 1) from 2) when looking for orthologues. So what's the problem? Cornelius thinks this logic is metaphysical because included in 2) are various religious notions about separate creation. But the fact is that these notions are not even considered by modern working scientists. p.s. there may be more than 2 explanations, but if so no one has articulated them thus far. ,,, exactly why are evolutionists so enamored to deny the glory that belongs to God alone for such a obscene level of craftsmanship that is sitting within their very own brains??? What then did you mean when you invoked design four times in the original post? 1. How, for example, are the channels designed to be ion-selective? 2. And new research continues to peel back the layers of this profound design. 4. One of the ever-present themes in the evolution genre is that similarity mandates evolutionary relationship. If two species share a common design, such as similar genes, it must have arisen from a common ancestor. The premise that similarities imply common descent is an evolutionary (and metaphysical) premise. No, it’s an empirical premise. Common descent is an empirical proposition about geneology, subject to confirmation or disconfirmation by evidence. Metaphysical propositions are not empirical and are therefore not at risk to evidence. Cornelius: "The premise that similarities imply common descent is an evolutionary (and metaphysical) premise." Pedant: "No, it’s an empirical premise. Common descent is an empirical proposition about geneology, subject to confirmation or disconfirmation by evidence. Metaphysical propositions are not empirical and are therefore not at risk to evidence." "Seeing that the complexity of one human Brain easily exceeds that of all the computers put together on earth, and seeing that evolution strains mightily to demonstrate the generation of ANY functional complexity above that which was already present, The conclusion for design is absurdly overwhelming!" If it is so absurdly overwhelming, how come the vast majority of scientists - the people who study actual evidence in a professional capacity in a very competitive environment - are not overwhelmed at all? Given that information, a reasonable person would ask herself if perhaps her feeling of being absurdly overwhelmed might be a little misplaced. Do you? I’m somewhat disappointed our ‘discussion’ of the paper lacks substantial reference to the methodology therein (or really the synapse itself, as nanobot points out). Rather, I see snippets mixed with personal incredulity, mixed with demands to prove matters well beyond the scope of what the authors actually try to tackle (which is the study of synaptic proteins through a proteomic/phylogenomic approach). Let me divide my reply into three parts, addressing complexity, uncertainty in science, and the actual data in the paper. “Random mutations must have struck on an amino acid sequence that would fold up just right to provide the right channel size. That is an astronomical long shot.” don’t even amount to Behe’s irreducible complexity, or calculations as to the edge of evolution! Hunter merely snipes: What are the odds!?! So, what are the odds? Although not the subject of the referenced paper, it is known experimentally, that changing only one to several key amino acids lining the pore can alter ion channel specificity. Transmembrane domains require simple patterns of hydrophobic and hydrophilic residues to insert into membranes. Pathways Hunter would like to select a review on this for us to debate. I doubt he will find the proposals satisfactory. Moreover, the ID field keeps conceding complexity can increase in evolution! “"Mutation, fitness, and choosing the fittest of a number of mutated offspring  are additional sources of active information in Avida we have not explored in this paper." So if mutation, and differential survival are active information that produce complexity in a simulation, what are they in nature. This applies to molecular evolution as well as populations. So, are fitness landscapes all too rugged (no), is there no population (life) observed, is there no source of biological variation (mutation, recombination…), do all populations fail to adapt (no), or is evolution tractable (not to mention directly observed). So what is the argument here-It cannot be? Because. Aren’t these concessions exactly right? In science, we propose hypotheses, provisionally, and seek data to refine or falsify the hypothesis. Isn’t this the exact opposite of the certain dogma Hunter sees in science? Hunter seems to want to turn science on its head. How does one come closer to understanding the truth in science, without proposing hypotheses, and testing them? He then goes into a typical creationist gallop, desiring to be shown every detail of every system, going back to the beginning. Is science about evidence coming together, or what a single paper presents? I suppose the logic here is that if we don’t know everything, we don’t know anything? The review proposes hypotheses, and presents supporting data for the synapse. That is all any science publication can and will do. Does this paper strongly support the evolution of the synapse? Yes. Does it provide an account of the detailed origin and molecular evolution of every component of the synapse? Of course not. Hunter seems to discount the content of a paper for what lies outside of the scope of the 11-page review! Are other people tackling ion channel evolution? Of course-Google. The protein complexes are present in modern organisms without synapses (without nervous systems, nerves, etc). I suppose if you totally dismiss common ancestry, and phylogenetics (which I guess you must) than the explanation makes less sense. Nevertheless, the data in the paper is compelling. Now again, the origin of these proto-complexes, the nerve beyond the synapes, etc. are beyond the scope of the review. We can argue them elsewhere, but don’t select a paper, yell about what it doesn’t even try to address, and deem it falsified! Designed? Interesting presumption. But, not even part of this paper. No, it’s an empirical premise. No, you cannot know that similarity is caused by common descent merely from science. No, common descent's predictions are routinely false. It, and always has been, motivated by philosophical and theological premises. subject to confirmation or disconfirmation by evidence. No, common descent is not subject to empirical falsification. If it were it would have long since been rejected. Metaphysical propositions are not empirical and are therefore not at risk to evidence. "No, you cannot know that similarity is caused by common descent merely from science." Why? Because one must put aside the non-scientific, non-disprovable hypothesis that a supernatural being might have designed everything with the exact appearance of common descent? We cannot know we are not in the matrix. But we can proceed with a hypothesis that is useful, predictive, and well supported. As I outlined above, there are two hypotheses for why a similar gene would be shared by different species: 1) common ancestry, 2) separate ancestry. Can you think of any others? THere are numerous ways to distinguish which of these hypotheses (and any others you can think of) is more likely to be correct. See the paper you totally and embarrassingly mangled earlier as an example. "No, common descent is not subject to empirical falsification. If it were it would have long since been rejected." Add to this the fact that Cornelius earlier stated that he found common descent of diatoms convincing. However, even though the same type of data have been used to establish common descent of chordates, he does not accept it. Now he says common descent itself is falsified. Fascinating. "No, common descent's predictions are routinely false." Really? I take it that "routinely" means far above the standard 5% error rate. Did you do a meta-analysis to reach this conclusion? Your diagrams of the ipods are just as arbitrary as whether to group men with red hair with women with red hair or men with black hair. Remember the nested hierachies I'm referring to, whether IPODS or living organisms are derived from shared traits and have nothing to do with descent with modification. What is your definition of a nested hierachy? If it is so absurdly overwhelming, how come the vast majority of scientists - the people who study actual evidence in a professional capacity in a very competitive environment - are not overwhelmed at all? So finding far more integrated complexity in the Brain than all the world's computers put together is not absurdly overwhelming to you in particular because you believe people who 'know better' are not impressed??? Given that information, a reasonable person would ask herself if perhaps her feeling of being absurdly overwhelmed might be a little misplaced. Do you? No my 'feelings' of awe towards what God has wrought are not 'misplaced' in the least, and exactly why are you so enamored to deny the glory that belongs to God alone? Do you somehow think you are smarter than the one who gave you such an obscenely complex computer for a brain in the first place? Neal Your diagrams of the ipods are just as arbitrary as whether to group men with red hair with women with red hair or men with black hair. Neal The APPLE IPOD product line easily fits into a "singular", "best", nested hierachy. It is a very successful product line. Neal The Apple IPOD product line is a good example of products that can be arranged in a best fit hierarchy. Let's use the current product line of one company (Apple)to keep things simple. 1. Which two of these three should be grouped closest together in your best fit nested hierarchy, and why? (d) None of the above, because you can't arrange iPods into best fit nested hierarchies because the designers are free to mix and match components and features, and in this case they did, making the creation a single objective best fit nested hierarchy impossible. 2. With iPod nanos, which come in 7 colors and 2 capacities, do we group them by color, or capacity, and why? (a) We should group by color, that is the most important trait. (b) We should group by capacity, that is the most important trait. (c) Grouping by either color or capacity is completely arbitrary; You can't group based on a panoply of features when there are so few distinguishing features. 2. alt: n other words, which one of these two is the correct, best fit grouping? Neal, if there is any way I can make these questions simpler, let me know. I can use less words and draw more pictures, if you like. Remember, the idea of grouping iPods is YOUR EXAMPLE, that YOU keep defending. My point was that you are weighing 8/16gb differences and color too much. You do not do this with species, right? The Shuffles are all the same, except for color and you treat the product line as though they were as different as Venus and Mars. In your multiple choice question, the Nano's use the same technology as the IPOD Touch for the touch screens. All the IPODS share technology across the entire product line. The Nano was designed to be a smaller and simpler version of the Touch. You're making a compelling argument for why designs fail to fit nested hierarchies. Thank-you. "You do not do this with species, right?" We can form nested hierarchies based on phenotype (including fossil), rRNA, selected protein sequences, whole genomes, or even protein expression profiles and protein families. The resulting phylogenies are remarkable consistent. Horizontal gene transfer can be taken into account. The hypothesis that there are multiple, independent origins of taxa can also be tested, and fails. "So finding far more integrated complexity in the Brain than all the world's computers put together is not absurdly overwhelming to you in particular because you believe people who 'know better' are not impressed???" I'm saying that what you consider as absurdly overwhelming evidence of design is not seen as such by people who know what they are talking about, unlike you. Your uneducated opinion means nothing. Are you familiar with geometric growth? It takes k rounds of cell division to get 2^k cells from a single initial cell. How complex is it to change k to k+1 or k+n? "No my 'feelings' of awe towards what God has wrought are not 'misplaced' in the least, and exactly why are you so enamored to deny the glory that belongs to God alone?" Why do you feel that your god needs an idiot like you to make her case? Let me guess-antibiotic resistant bacteria are less fit than wild-type in the absence of antibiotic? air (underwater) you show less fitness than fish. Adaptation only makes sense in the presence of the environment adapted to. Silly creationist "survival of the fittest" strawman. Not to mention the loss of fitness is not always observed, and often compensated. Whoever made that video certainly was a feeble minded idiot. Evolutionary fitness isn't an absolute measurement. The measure of evolutionary fitness only has meaning relative to the local environment. A great white shark has amazingly high evolutionary fitness in its ocean environment, but drop it into the middle of the Sahara desert and see how long it lasts. Bacteria that evolved resistance to a certain drug are more fit that those who don't in the presence of that drug. If you change the environment and take the drug away, it's not surprising at all that the relative fitness of the two organisms will change. Neal: My point was that you are weighing 8/16gb differences and color too much. You do not do this with species, right? The Shuffles are all the same, except for color and you treat the product line as though they were as different as Venus and Mars. Then I take that as your concession that iPod nanos can't be grouped into a best fit nested hierarchy and that your answer to question # 2 is c. Is that correct? And yes, for the most part, we can group species into best fit nested hierarchies, but not individuals within species. Zachriel already explained to you that organisms within interbreeding populations don't form a hierarchy based on traits. Neal: In your multiple choice question, [by which I presume you mean number 1; I numbered them for a reason as they were both multiple choice.] the Nano's use the same technology as the IPOD Touch for the touch screens. All the IPODS share technology across the entire product line. The Nano was designed to be a smaller and simpler version of the Touch. It's not even like I'm asking you to do a lot of work. I put it into a multiple choice format so that you'd only have to type one letter. And if you can think of another option besides these 4, be my guest to elaborate. Or you can continue flailing about. Like who? Please provide quotes to back up this statement. Whereas the electricity that powers our computers comes from the flow of electrons through a conductor and “hates” water, the electricity that runs our bodies is designed for a wet environment and uses pumped ions to help convey differing messages to our command center. In this environment mere electrons are of little use because they would be easily dispersed. What is needed is something bigger. And as I eluded to in my opening an ion or ions will fit the bill. Well there just happen to be two atoms well suited for ionization- two atoms with 1 outer valence electron. If we take a look at the Periodic Table, and also a look at the electron shell arrangement (note the sodium diagram on the right and also thepotassium arrangement, we see these atoms are perfect fits for the job of positive ions (as both have only one outer valence electron). 10 million to 100 million per second! However even these, in comparison to electrons, huge ions also get lost in the wet environment. So what is needed are pumps along the way to pump ions in and also out. In the case of our nerve cells, ions go in to start the signal and are pumped out to reset that part of the system so it is ready for the next (or continuing) sensation. See nerve cell. However our nerves to not touch each other as wires do in an electrical system to make a circuit. Neurons have functional connections called synapses. 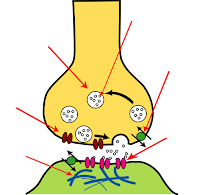 These can connect neuron to neuron or other types of cells (for example muscle). 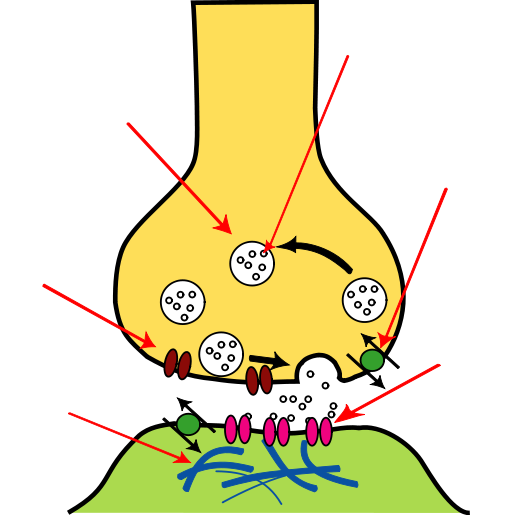 Between the synapse and the next cell is a gap- the synaptic cleft. This is key because if the neurotransmitters stay docked the receiving cell would remain locked in that sensation. And if any unused neurotransmitters- the synaptic cleft is basically flooded to ensure signal transmission- remain they will just fill in the docking site when the first arrivals are gone. IOW the receiving cell will be locked in that past sensation. And there are different types of neurotransmitters for different sensations and purposes. How is this evidence for ID? The nervous system exhibits planning- it takes planning to get the right ions, ion channels, pumps and neurotransmitters. Evolutionists frequently point to the development of antibiotic resistance by bacteria as a demonstration of evolutionary change. However, molecular analysis of the genetic events that lead to antibiotic resistance do not support this common assumption. Many bacteria become resistant by acquiring genes from plasmids or transposons via horizontal gene transfer. Horizontal transfer, though, does not account for the origin of resistance genes, only their spread among bacteria. Mutations, on the other hand, can potentially account for the origin of antibiotic resistance within the bacterial world, but involve mutational processes that are contrary to the predictions of evolution. Instead, such mutations consistently reduce or eliminate the function of transport proteins or porins, protein binding affinities, enzyme activities, the proton motive force, or regulatory control systems. While such mutations can be regarded as “beneficial,” in that they increase the survival rate of bacteria in the presence of the antibiotic, they involve mutational processes that do not provide a genetic mechanism for common “descent with modification.” Also, some “relative fitness” cost is often associated with such mutations, although reversion mutations may eventually recover most, if not all, of this cost for some bacteria. A true biological cost does occur, however, in the loss of pre-existing cellular systems or functions. Such loss of cellular activity cannot legitimately be offered as a genetic means of demonstrating evolution. I'm saying that what you consider as absurdly overwhelming evidence of design is not seen as such by people who know what they are talking about, unlike you. Actually it is seen by such people. They just call that design illusory and say without jusitification that evolutiondidit. IOW the same people that say the design is illusory cannot produce any evidence to supprt that claim. and with the appearance of Joe G go any chances of this being a productive or interesting thread. Joe G got tired of posting on Telic Thoughts as his sock 'ID guy' and decided to bless us with his 150 IQ here. He's an equal opportunity tard. Umm those chances were shot with the arrival of you intellectual cowards- ie evolutionists. Ya see nanobot you STILL don't have any evidence that blind, undirected chemical processes can construct functional multi-part systems. So all you have is to atack ID and IDists. And thorton is STILL upset that I have exposed her ignoarnce on several occasions. Ya see Joe G you STILL don't have any evidence that blind, undirected geological processes can construct functional multi-part Grand Canyons. So all you have is to attack Intelligent Geology and IGist. And Derick has to chime in with his usual ignorance. Ya see Derick you still don't have any positive evidence that the Grand Canyon was designed. Also I have never attacked Intelligent Geology nor an IGist. You are a liar. The antibiotic resistance argument is not only wholly off topic, but has been demolished at timestamps 12:06 and 12:08 above. As for "The nervous system exhibits planning- it takes planning to get the right ions, ion channels, pumps and neurotransmitters," how do you detect and quantify planning? How do you distinguish it from the non-random, information increasing products of variation + natural selection? Are the proto-synapses described in this paper less planned or some kind of a plan gone wrong? Why do plans require intermediates that follow phylogeny? I will say that troy, thorton, Derick, Zachriel, Robert C, Nick M, et al., are very powerful evidence that humans did indeed evolve from lower animals. How about we all agree not to respond to anything psychopath Joe G says? He'll get bored sooner or later and torture some animals in his basement. ,,,then does it not follow that if one claims to have a more evolved brain, then in reality that person is claiming to have more brain damage than feeble minded non-evolved brains? Joe G: Many bacteria become resistant by acquiring genes from plasmids or transposons via horizontal gene transfer. Sure they can, but the classic experiments work with clones. How can you demolish scientific fact? As for "The nervous system exhibits planning- it takes planning to get the right ions, ion channels, pumps and neurotransmitters," how do you detect and quantify planning? Pretty much the same way archaeologists and forensic scientists do- but figuring out what is required to bring about the observed result. How do you distinguish it from the non-random, information increasing products of variation + natural selection? If the variation is via genetic accidents and the "selection" is natural selection then there isn't anything non-random about it. Ya see RobertC you don't have any evidence that an accumulation of genetic accidents can construct a functional multi-part system. Are the proto-synapses described in this paper less planned or some kind of a plan gone wrong? Dude your position can't explain cellular differentiation without resorting to magic. Ya see Joe, the fact that materialistic atheists like you can't produce a single fact that the Grand Canyon wasn't designed is positive evidence. All you have is the fairytale mechanism of 'macroerosion.' The lack of any plausible naturalistic mechanism is positive evidence for design. Joe G: Also I have never attacked Intelligent Geology nor an IGist. You are a liar. Oh have you changed your mind? Last I heard you didn't think the Grand Canyon was directly carved out of the ground by God, and that you thought "natural" processes were "sufficient" to account for it. (even though these supposed 'natural processes' have never been demonstrated in the lab. troy- all you can do is respond with asnine snide remarks and your usual evotardgasms. So please don't respond to me. However I will keep exposing your lies, ignorance and intellectual cowardice. Ya see Joe, the fact that materialistic atheists like you can't produce a single fact that the Grand Canyon wasn't designed is positive evidence. Spoken like a real atheistic liar. What happened Derick- did priests molest you as a child and you liked it? "Yet all "evolution" is shown to be the result of a loss of functional complexity on the molecular level"
Whaa? That's a howler. Even within antibiotic resistance (subject of the link), there are many gain of function mutations-expanded spectrum beta-lactamases, thickened cell walls, evolved multi-subunit drug efflux pumps. 1) A quote from Dembski and Marks: "Mutation, fitness, and choosing the fittest of a number of mutated offspring  are additional sources of active information in Avida we have not explored in this paper." So if mutation, and differential survival are active information that produce increased complexity and information in a simulation, what are they in nature? This applies to molecular evolution as well as populations. So, are fitness landscapes all too rugged, is there no population (life) observed, is there no source of biological variation (mutation, recombination…), do all populations fail to adapt or is evolution tractable (not to mention directly observed)? Joe G: "What happened Derick- did priests molest you as a child and you liked it?" Joe, didn't your psychologists warn you about projecting? And is that all you can do? Using personal attacks to try to distract everyone from the fact that your position of materialist geology is scientifically vacuous? Excerpt: Initially, it was difficult to demonstrate differences between wild-type and clinical strains in a rich media (Nutrient or Typticase-soy agar). There were no differences in growth rate or colony size. However, after switching to minimal media and observing hourly, the differences were readily observed. In order to confirm and extend the differences in growth rates between the sensitive BS303S strain (isolated from pond water) and the resistant WFR strain, a fitness/competition assay was performed. This assay sought to simulate famine conditions in the natural environment by utilizing minimal media and to evaluate the wild-type against ampicillin resistant, clinical strains exhibiting loss of prodigiosin production. Once subjected to conditions that were “harsh,” differences were seen in their performance (growth rate and robustness of colonies). Excerpt: Most mutations in the genes of the Salmonella bacterium have a surprisingly small negative impact on bacterial fitness. And this is the case regardless whether they lead to changes in the bacterial proteins or not.,,, using extremely sensitive growth measurements, doctoral candidate Peter Lind showed that most mutations reduced the rate of growth of bacteria by only 0.500 percent. No mutations completely disabled the function of the proteins, and very few had no impact at all. Even more surprising was the fact that mutations that do not change the protein sequence had negative effects similar to those of mutations that led to substitution of amino acids. A possible explanation is that most mutations may have their negative effect by altering mRNA structure, not proteins, as is commonly assumed. The simulation is a targeted search. In nature there isn't any such thing- well according to the ToE there isn't any such thing. Yes we do and I have presented it to you. OTOH you don't have any positive evidence for the design of the Grand Canyon. And actually we have more evidence that blind, undirected geological processes can produce the Grand Canyon than we do for the theory of evolution. Though it is impossible to reconstruct the DNA of these earliest bacteria fossils, scientists find in the fossil record, and compare them to their descendants of today, there are many ancient bacteria spores recovered and 'revived' from salt crystals and amber crystals which have been compared to their living descendants of today. Some bacterium spores, in salt crystals, dating back as far as 250 million years have been revived, had their DNA sequenced, and compared to their offspring of today (Vreeland RH, 2000 Nature). To the disbelieving shock of many scientists, both ancient and modern bacteria were found to have the almost same exact DNA sequence. BA77, how do you explain this? "The fitness landscape in sequence space determines the process of biomolecular evolution. To plot the fitness landscape of protein function, we carried out in vitro molecular evolution beginning with a defective fd phage carrying a random polypeptide of 139 amino acids in place of the g3p minor coat protein D2 domain, which is essential for phage infection. After 20 cycles of random substitution at sites 12–130 of the initial random polypeptide and selection for infectivity, the selected phage showed a 1.7×104-fold increase in infectivity"
Excerpt: The increased availability of sequenced bacterial genomes allows application of an alternative estimator of drift, the genome-wide ratio of replacement to silent substitutions in protein-coding sequences. This ratio, which reflects the action of purifying selection across the entire genome, shows a strong inverse relationship with genome size, indicating that drift promotes genome reduction in bacteria. troy and yet the evolved protein did not achieve the level of functionality of the 'coating' protein that was removed. JoeG-"The simulation is a targeted search. In nature there isn't any such thing- well according to the ToE there isn't any such thing." Dodging the point. Dembski accidently concedes mutation +selection increases information. The context is irrelevant. Want to maybe pick a single topic, preferably with a paper you've actually read to debate? The typical creationist Gish gallop of topic switching and one-liners really isn't worth anyone's time. "One of the ever-present themes in the evolution genre is that similarity mandates evolutionary relationship." So you don't accept the utility of paternity testing? Or is this one of those micro-/macro distinctions? RobertC you have not dealt effectively with the fitness test. That compensatory mutations would arise from the preexisting programming within the genome, and that the fitness is still not as 'fit' as it was prior to the original mutation, when the test is increased for 'sensitivity', shows that you have not seriously considered the matter. The 'fitness' test is that a antibiotic resistant bacteria in a non-antibiotic containing environment sometimes shows decreased fitness. 1) Adaptation is for the environment of selection. You are evolved, but not adapted to life in water. Clear enough? By the way, decreased fitness does not disprove evolution. 2) Not all antibiotic resistance comes with a fitness cost. "would arise from the preexisting programming within the genome"
Could you describe the nature of this programming? Could you find pre-programmed adaptive mechanisms before adaptation and describe them to me? This would be of enormous use in predicting pathogen behavior. By the way, did the 'designer' load in these antibiotic resistances and compensatory mechanisms? What are you talking about? The unpublished Liberty U. data? There is no control showing their isolate form pond water is in all other ways related to the other bacteria. The study needs to be done with the resistant strain, and its progenitor, not some other isolate that may have enhanced fitness for other reasons, and may be wholly unmatched in starting genotype! Here is an empirical proposition: “The similarity of John’s genetic profile to the genetic profile of this woman who claims to be his birth mother is scientific evidence that this woman is actually his birth mother.” What non-scientific evidence or premise needs to be considered in this case? That error in elementary logic earns Hunter an F for this study unit. Being subject to falsification does not equal being falsified. No, common descent's predictions are routinely false. That’s an empirical proposition that awaits disambiguation. Does “routinely” mean most of the time, more often than not, sometimes, what? It seems to me that we need a comprehensive listing of all predictions based on common descent as the denominator, so we can fill in all the false predictions as the numerator before we can calculate the value of the sought after fraction. Shuffles are grouped under IPODS in a high level hierarchical view. All Shuffles are IPODS. The containment within the higher level is complete and meets the requirement of a best fit. Perhaps it may help you to understand by roughly equating the terms Shuffle, Nano, etc with "species" names. Maybe this will help you not to be inconsistent in looking at minor characteristics like color or memory. If #2 in your picture link is a Nano, then my choice would be "B". The term IPOD would be given a higher rank. It would be reasonable to add another category below this rank to group the touch screen IPODS. What evolution really predicts is a blurred relationship among organisms, not the sharp distinctions found in the fossil record and extant species. Even you mention, quote, "for the most part" species can be grouped into a best fit nested hierarchy. If common descent yields both nested and non nested, then showing a nested hiearchy can't be evidence for descent. If it can also yield an non-nested structure, then it is another evolutionary pleading to have the evidence both ways. Guess who subjectively and arbitrarily determines what "generally" means? The the point I'm making is that a nested hierarchy neither falsifies or confirms evolution. You love your out of context quotes. The very next line: "The argument for evolution comes from a particular property of the classificatory hierarchy, the kind of traits that define it." And then describes the unique traits of genealogically generated nested hierarchies, of how life's nested hierarchy is not "forced." Your quote is apparently from another source. Perhaps his first quote was talking about all the instances when grouping is not a particular property and "forced". So the nested hierachy is evidence for evolution except when it isn't. Evolutionists like to have the evidence both ways. Sorry....I had a source with ellipses. Please tell me what the line is following: "The fact that life can be classified hierarchically is not, in itself, an argument for evolution. " I believe it is: "The argument for evolution comes from a particular property of the classificatory hierarchy, the kind of traits that define it." followed by the discussion of the unique traits of genealogically generated nested hierarchies, of how life's nested hierarchy is not "forced." "So the nested hierachy is evidence for evolution except when it isn't"
Except no one argues it isn't, especially in that the key defining trait of the nested hierarchy of life is descent with modification! And Neil, I'm betting your source was Ashby L. Camp, considering the "(Ridley 1985, 8.)" "I omitted Ridley’s statement that life exhibits a genuine hierarchy because it was irrelevant to my point." That isn't very honest, now is it. Even worse, it gets picked up by creationists like you who use it to imply the opposite of what Ridley was arguing. Interestingly, it fits the discussion here perfectly. Designed objects like IPODs and furniture can be forced into a some piecemeal hierarchy, with confusion due to swaps in design, while evolution's nested hierarchy is genealogically generated, a genuine hierarchy in ALL the useful ways we could make it! Sure they do... when they say "for the most part", or "generally" because classification is not merely slam-dunk easy and singular. If A is evidence of B, and Not A is also evidence for B, then it is impossible to falsify. Descent with modification really expected an innumerable blurring relationship among organisms. Evolutionists merely accommodated the nested hierarchy because they could not deny it. Darwin would have preferred to have seen a blurring of relationships not a typology. Ok Neal, I'll humor you. What is the "Not A" evidence against nested hierarchies? "Darwin would have preferred to have seen a blurring of relationships not a typology." the evidence for the detrimental nature of mutations in humans is overwhelming for scientists have already cited over 100,000 mutational disorders. Excerpt: "Another compilation of gene lesions responsible for inherited diseases is the web-based Human Gene Mutation Database (HGMD). Recent versions of HGMD describe more than 75,000 different disease causing mutations identified to date in Homo-sapiens." HGMD®: Now celebrating our 100,000 mutation milestone! I really question their use of the word 'celebrating'. Excerpt: Shakhnovich's group found that for most organisms, including viruses and bacteria, an organism's rate of genome mutation must stay below 6 mutations per genome per generation to prevent the accumulation of too many potentially lethal changes in genetic material. Excerpt: We conducted a genotype-phenotype association study in 470 Tanzanians, Kenyans and Sudanese and identified three SNPs (G/C-14010, T/G-13915 and C/G-13907) that are associated with lactase persistence and that have derived alleles that significantly enhance transcription from the LCT promoter in vitro. These SNPs originated on different haplotype backgrounds from the European C/T-13910 SNP and from each other. Excerpt: The truth is that common ancestry is merely an assumption that governs interpretation of the data, not an undeniable conclusion, and whenever data contradicts expectations of common descent, evolutionists resort to a variety of different ad hoc rationalizations to save common descent from being falsified. Excerpt: "What's unique about Tibetans is they don't develop high red blood cells counts,"
Extremely fit individuals may have higher values—significantly more red cells in their bodies and significantly more oxygen-carrying capacity—but still maintain normal hematocrit values. ,,,Thus they were actually incorrect to imply that all high red blood cell counts found in humans are detrimental,,, Thus this is clearly another example of a loss of overall functional information, and fitness, for the human genome. Excerpt: this means the probability of all three sites changing “at once” (6.25 X 10^-9)^2 = approx. 4 X 10^-17 specific bp change/ yr. IOW (In Other Words), for that size population, and this is a very reasonable guess for size, it would take almost twice the life of the universe for them to take place “at once”. Thus, the invocation of “randomness” in this whole process is pure nonsense. We’re dealing with some kind of programmed response if, in fact, “polygenic selection” is taking place. And, that, of course, means design. What is your point? Humans are subject to a terrible mutation load, yielding birth defects, leukemia and cancer, etc. Does this mean evolution is false?Does it prove design by a benevolent god? "Robert, you may be evolved, but I was created by God"
Odd statement. I take no insult, but trust me, we're subject to the same mutation load, and the ills that come with it. And yes, the human mutation rate might be unsustainable. Perhaps we are destined for extinction, or to evolve into a species with better mutation management. Perhaps we will have to genetically engineer ourselves. Then again, perhaps the measured rates are high, or the bulk of fertilized eggs that fail to implant and form a human are selectively weeding out some of the bad. I know John Sanford tries to argue that mutation rate means evolution is false. But he'd have to argue that the current carried mutation load with current natural selection acting on humans is identical to that of our entire evolutionary history-a false premise! Lactase: 3 different mutations that keep lactase turned on in different populations. Problem? "Moreover it clearly appears to be a 'designed mutation' that has 'serendipitously' originated independently three different times." So convergent evolution=design? Strong conclusion there. "A Primer on the Tree of Life - Casey Luskin - 2009"
No interest in arguments coming from the DI lawyer. Tibetans- have high altitude adaptations. How do you know these weren't alleles in the pre-Tibetian population that became dominant with high-altitude living. How do you know how many loci ("all three sites") changed, and that they changed simultaneously (no neutral changes). Your math assumes this. I'd also love for you to explain the numbers. The best estimate I know of is a intergeneration mutation rate of ~1.1 × 10−8 per position per haploid genome. "The sweep of anatomical diversity reached a maximum right after the initial diversification of multicellular animals. The later history of life proceeded by elimination not expansion." "Also that mammalian life was richer in kinds, of larger sizes, and had a more abundant expression in the Pliocene than in later times." "Alexander Kaiser, Ph.D., of Midwestern University’s Department of Physiology,,, was the lead author in a recent study to help determine why insects, once dramatically larger than they are today, have seen such a remarkable reduction in size over the course of history." Excerpt: "As the history of animal life was traced in the fossil record during the 19th century, it was observed that once an anatomical feature was lost in the course of evolution it never staged a return. This observation became canonized as Dollo's law, after its propounder, and is taken as a general statement that evolution is irreversible." Excerpt: We predict that future investigations, like ours, will support a molecular version of Dollo's law:,,, Dr. Behe comments on the finding of the study, "The old, organismal, time-asymmetric Dollo’s law supposedly blocked off just the past to Darwinian processes, for arbitrary reasons. A Dollo’s law in the molecular sense of Bridgham et al (2009), however, is time-symmetric. A time-symmetric law will substantially block both the past and the future. Excerpt: "It appears that organisms displayed “rampant” within-species variation “in the ‘warm afterglow’ of the Cambrian explosion,” Hughes said, but not later. “No one has shown this convincingly before, and that’s why this is so important. ""From an evolutionary perspective, the more variable a species is, the more raw material natural selection has to operate on,"....(Yet Surprisingly)...."There's hardly any variation in the post-Cambrian," he said. "Even the presence or absence or the kind of ornamentation on the head shield varies within these Cambrian trilobites and doesn't vary in the post-Cambrian trilobites." University of Chicago paleontologist Mark Webster; article on the "surprising and unexplained" loss of variation and diversity for trilobites over the 270 million year time span that trilobites were found in the fossil record, prior to their total extinction from the fossil record about 250 million years ago. If the abrupt appearance for all the completely different and unique phyla in the Cambrian was not bad enough for materialists, the fossil record shows there was actually more variety of phyla by the end of the Cambrian explosion than there are today due to extinction. "Stasis in the Fossil Record: 40-80% of living forms today are represented in the fossil record, despite being told in many text books that only about 0.1% are in this category. The rocks testify that no macro-evolutionary change has ever occurred. With the Cambrian Explosion complex fish, trilobites and other creatures appear suddenly without any precursors. Evidence of any transitional forms in the fossil record is highly contentious." ...and Batspit77 takes the lead over Eocene in the Pointless Wall Of Text match race! "Robert, you have zero evidence for uncontroversial 'beneficial' mutations in either bacteria, or humans." Gould was an evolutionary biologist. Not sure what his quotes are here for. "An organism is unable to return, even partially, to a previous stage already realized in the ranks of its ancestors." Connection to genetic entropy? Who knows? (Behe link broken). Interestingly, Dollo's law has found defense at the molecular level: doi:10.1038/nature08249 (but this is in no way related to genetic entropy). "the fossil record shows there was actually more variety of phyla by the end of the Cambrian explosion than there are today due to extinction." Stasis in the Fossil Record: 40-80% of living forms today are represented in the fossil record"
So there where 20 or so more phyla than current, but 80% of species are with us today? Trilobites, dinosaurs, seed ferns? p.s. The majority of your links are broken. Might want to check them. Especially since you seem unable to actually internalize them and make a point. "Mutation, fitness, and choosing the fittest of a number of mutated offspring  are additional sources of active information in Avida we have not explored in this paper." So if mutation, and differential survival are active information that produce complexity in a simulation, what are they in nature? robert, your mutation examples ALL seem to confer advantage by breaking something without even getting into the details of where the loss in functionality is paid. Since pathetic excuses for the sheer poverty of evidence for neo-Darwinism do not interest me as to the honesty displayed on your part in finding truth in this matter, I bid you ado. "Robert, your mutation examples ALL seem to confer advantage by breaking something "
You read all 23 papers this hour and determined this? Funny, even the first paper makes it clear in the ABSTRACT (first 100 words!) the gain of fitness in one environment was not accompanied by loss of fitness in others in most lines. Adaptation to High and Low Temperatures by E. coli. "Tradeoffs in relative fitness did not necessarily accompany fitness improvements, although tradeoffs were observed in a few of the lines." Hmm. Need I go through the rest, and show how wrong you are? You see, I read and comprehend my sources before spewing them all over the internet. Isn't there something about bearing false witness in your favorite book? Liar. Let anyone judge the truth of this by clicking on them. Few work. Don Patton also lies about the second law of thermodynamics (min 11:31 of your video)-he claims it always shows disorder must increase, therefore no evolution, only genetic entropy. Oops-he conveniently "forgets" about the closed system business. Middle-school physics. Guess ice can't freeze, and I can't be writing this. This howler took me about 30 seconds of clicking through the video. Should I watch the rest, and find more lies you'd like to share? "do not interest me as to the honesty displayed on your part in finding truth in this matter,"
Honesty. LOL. I've put your lies on display here. Practically no one ever responds to thornton or RG. Hopefully they'll figure out that its because nothing they say is worth refuting since its all hubris and the ubiquitous evolutionary speculations, gratuitous extrapolations and conjecture. Umm oops, sorry thornton, I forgot to mention your universal but vacuous diatribe. And so there you have it. When confronted with the synapse, neurons, action potentials, an army of molecular machines, and complexity that Darwin could never even have dreamt of, evolutionists remain resolute in their dogma. Their theory is a fact, no question about it. The human brain is truly awesome. It has more switches than all the computers and routers and Internet connections on Earth. It has hundreds of trillions of synapses, which is about how many stars fill 1,500 Milky Way galaxies, and each synapse is profoundly complex, and moreso than we thought even a few years ago. All this and much more, and yet evolutionists insist it is a fact that these, and oh by the way all of biology, just happened to arise on their own. Theories can be outlandish, even absurd sounding, but facts must be facts. The evolutionary claim that evolution is a fact is so bizarre it would be unbelievable if I didn't see it for myself. Until this I never understood the point of Hans Christian Andersen's *The Emperor's New Clothes. * It seemed completely unrealistic. But now, it is so real. Evolutionists argue every which way to avoid the obvious absudity of their claims. And they will continue. There is no turning back for them, because this isn't about science. Evolutionists are trapped in their metaphysics which they would have to question if they acknowledged the science. It is an incredible example of the lies we tell ourselves. Bold! After all this, having answered nothing, you declare victory? And you do so merely by restating your personal incredulity! Complex=not evolved. What genius! This applies to molecular evolution as well as populations. So, are fitness landscapes all too rugged (no), is there no population (life) observed, is there no source of biological variation (mutation, recombination…), do all populations fail to adapt (no), or is evolution tractable (not to mention directly observed)." "Evolutionists argue every which way to avoid the obvious absudity of their claims. And they will continue. There is no turning back for them, because this isn't about science." There is no victory here to declare. How can one declare victory over foolishness? "Hey, it's Mr. Produce to man, (except that wasn't at all what we were talking about) Eocene. Googled mushroom bodies yet? I thought we wouldn't see you soon-but I guess you have no shame in your ignorance. Faith does wonderful things, I guess"
You sound really angry with every new post ??? Interesting, could you explain to us what are the methods to distinguish between common ancestry and convergence ? That does not say that information increases. The simulation is a targeted search. In nature there isn't any such thing- well according to the ToE there isn't any such thing." It's not dodging the point as the point is that blind, undirected chemical processes cannot produce CSI from scratch nor increase the amount of SI. Mutation, fitness, and choosing the fittest of a number of mutated offspring  are additional sources of active information in Avida we have not explored in this paper. does not say what you think it says. ACTIVE information means a designer was required. The paper is dealing with the fact that the alleged evolutionary algorithms are actually nothing of the kind. The only way descent with modification would create/ produce a nested hierarchy is if and only if traits are unique and unreversed. What is also required is that there can be no interbreeding, which is what would occur if all the transitionals were still around. And then there is the part about there not being any evidence for the alleged tree of life. So you don't accept the utility of paternity testing? It works fine for the same species. That's because we present actual scientific data instead of the hand-waving bluster of morons like you, and you have no answers or explanations for actual data. ...as you peek out from your hiding place, still scared spitless to actually engage those knowledgeable on the subject. How's that disproof of evolution by equations from statistical mechanics coming along? There isn't any scientific data that supports your position. as you peek out from your hiding place, still scared spitless to actually engage those knowledgeable on the subject. That wouldn't be you as you have no knowledge whatsoever. It's done by examining the differences between the two specimens, not just looking at the similarities. There are many cases where nature has produced superficially similar morphologies - streamlined fish and porpoises, for example. This happens because there are only a finite way to solve physics problems: how to move efficiently through water, how to create lift with a wing, etc. Even at the molecular level we sometimes find functional convergence, because nature happens to hit on the same solution to a problem twice. But when you get down to the details, you find different internal makeup, different overall DNA makeup, etc. It's not the devil but the deciding scientific evidence that's in the details. That's the point. Your position cannot explain the differences with scientific data. There are many cases where nature has produced superficially similar morphologies - streamlined fish and porpoises, for example. Begs the question- how do you know nature produced it? Joe There isn't any scientific data that supports your position. Joe, there isn't any scientific data that supports YOUR position that the Grand Canyon wasn't designed. There isn't any evidence that it was designed. That's the point. No sign of counterflow. That said I am not against the possibility that it was designed. IOW Derick once again you prove that you are about as christian as mr hankey. So why do you have to lie and mock your position? Do you think that is a good defense? As predicted the intellectual cowards show their true colors when pressed to support their position. Unfortunately thorton the stupidity is all yours- I see you are still upset that I keep exposing your ignorance. Deal with it or better yet get an education. And so there you have it. When confronted with the synapse, neurons, action potentials, an army of molecular machines, and complexity that Darwin could never even have dreamt of, evolutionists remain resolute in their dogma. On the contrary, biologists are still working out the entailments of the theory of evolution because those entailments keep raising new questions for research. The'll drop it in a minute if a theory with better entailments is proposed. The door is open, come on in. Their theory is a fact, no question about it. You keep saying that, but it is not correct. Scientists know the difference between the fact of evolution (a historical proposition supported by weight of evidence) and the theory of evolution, which has many empirical entailments. On the contrary, biologists are still working out the entailments of the theory of evolution because those entailments keep raising new questions for research. Which is good because the more they work on those entailments the better ID looks. Derick: Joe, there isn't any scientific data that supports YOUR position that the Grand Canyon wasn't designed. There isn't any evidence that it was designed. That's the point. Ha! Joe is one of those religious fundy people who thinks macro-erosion is just lots of accumulated micro-erosion. Were you there Joe?? Did you see it macro-erode?? How can we test the premise that the Grand Canyon eroded in a place that never had one via an accumulation of geologic accidents? I asked: 1. Which two of these three should be grouped closest together in your best fit nested hierarchy, and why? Neal: If #2 in your picture link is a Nano, then my choice would be "B". 1 and 2 both have a small aluminum form factors; 3 is shaped like an iPhone. 1 and 2 both lack built-in microphones; 3 does not. So with that many features that 1 and 2 have in common, why in the world did you group 2 and 3 together? Neal: The the point I'm making is that a nested hierarchy neither falsifies or confirms evolution. Neal, this is going to be the first time I've accused you of lying. You're backtracking to save face. Your 'point' was that "The Apple IPOD product line is a good example of products that can be arranged in a best fit hierarchy." Like I said, this discussion is independent of evolution. It pertains to whether or not iPods (and/or species) can be categorized into best fit nested hierarchies. Species can, iPods cannot. The reason iPods cannot is because their designers are unconstrained; they can mix and match features and components across lines, thus destroying the possibility of a single, best fit nested hierarchy based on a panoply of features. Species can for the most part be grouped in best fit nested hierarchies, but the significance of that is apparently still up for debate. Neal: Even you mention, quote, "for the most part" species can be grouped into a best fit nested hierarchy. If common descent yields both nested and non nested, then showing a nested hiearchy can't be evidence for descent. Common descent (To my knowledge, someone correct me if I'm wrong) does not posit non-nested hierarchies among populations that do not swap genetic material. The reason for the 'for the most part' and 'generally' qualifiers when discussing species is because species is not a well defined term to begin with. Sometimes organisms that are considered different species can interbreed. It's already been explained to you several times that interbreeding populations can't always be grouped into a best fit nested hierarchy based on traits, just as you can't group iPod nano's into a SINGLE best fit nested hierarchy. Joe is one of those religious fundy people who thinks macro-erosion is just lots of accumulated micro-erosion. Except I am not religious and the Grand canyon could be accounted for by one event. We have evidence for such a thing. A family tree is not a nested hierarchy because there isn't any containment- different families intermingle meaning one person is a part of several different family trees. That said universal common descent is allegedly one big family tree. Also with organisms it all depends on what traits are picked, just as with IPODs. Look Neal, you've got someone on your side! Oh, wait- it's Joe. Joe G: A family tree is not a nested hierarchy because there isn't any containment- different families intermingle meaning one person is a part of several different family trees. Exactly! Joe, It seems for once I agree with you 100%. The problem is no one here has ever said that a family tree of interbreeding individuals makes a best fit nested hierarchy based on traits. Pay attention. Joe G: That said universal common descent is allegedly one big family tree. With one HUGE difference: The tree of life illustration represents uncrossed lines of descent. This is an important concept, but a simple distinction. I'm not sure why it's so hard to understand. Joe G: Also with organisms it all depends on what traits are picked, just as with IPODs. And on an irrelevant side note, it's 'iPod', not 'IPOD'. The problem is no one here has ever said that a family tree of interbreeding individuals makes a best fit nested hierarchy based on traits. The problem is evos have said it- but that isn't the point. So the problem is you aren;'t paying attention. UCD is a family tree. The tree of life illustration represents uncrossed lines of descent. The theory doesn't predict uncrossed lines and there isn't any evidence for such a tree! In order for descent with modification to form a nested hierarchy the defining characteristics must be unique and unreversed. We know evolution isn't like that. Also all transitionals must be eliminated so that there isn't any crossing of lines. Right, we can do that because of a common design. thorton: Joe is one of those religious fundy people who thinks macro-erosion is just lots of accumulated micro-erosion. One designed event, just like we said. All you have to do to falsify the canyon Design hypothesis is provide evidence that blind undirected geologic accidents can account for all the amazing geologic complexity we see. Yet there isn't any evidence for design. You don't have such a hypothesis because you don't have any positive evidence for it. But keep on being an imbecile we all understand that is your best shot. There isn't any evidence that it (the Grand Canyon) was designed. That's the point. Well I keep hearing that your theory of geology is a scientific theory yet all alleged hypotheses are just general, ie have nothing to do with any of the theories proposed mechanisms, and as such can be used to support alternative scenarios. IOW it appears your theory of geology cannot even muster a hypothesis that is exclusive. Not only that there still isn't any evidence that demonstrates the proposed mechanisms can construct a functional multi-part canyon system. Are there any geotards like Joe G out there who are up to the task of producing a testable hypothesis for your position? One that excludes other alternatives? Or is the best you can do is to attack Intelligent Canyon Design and all alternatives- IOW do you really think your negative attacks amount to positive evidence? You must be hearing things- there are doctors that can help you with that. But nice evotardgasm- it really exposes your desperation. Your position doesn't have any evidence. How can we test the premise that the Grand Canyon evolved in a place that never had one via an accumulation of geologic accidents? Straw man- we don't know the initial conditions and it doesn't have to be via an accumulation of geologic accidents. And even with that you don't have any evidence for your position. However you are the best evidence taht humans evolved from lower animals. Neal, I hope you appreciate how much effort I'm putting into helping you prove your point; I've made one more chart to make things easier for your iPod classification. I've made 4 different possible iPod nested hierarchies, all I need you to do is tell me which one, if any, is the 'best fit', based on a panoply traits. (if the 'correct' one isn't listed, feel free to present it in your response. You do not have to draw a graph, a parenthetical list will suffice.) For reference, directly below it is a similar configuration of 4 different possible nested hierarchies of animals: A fish, dolphin, penguin, and cat. Perhaps you can tell me which one of those, if any, is the 'best fit' based on a panoply of traits. Again Neal, you claim that "the APPLE IPOD product line easily fits into a "singular", "best", nested hierachy." All I'm asking is that you simply provide that singular, best fit nested hierarchy, and explain why you grouped them that way. Since we decided to call each line a 'species' you only have to classify four things: shuffle, nano, classic, & touch. I'm even doing the grunt-work of providing options for you to pick from. Again, I really don't think this is to much to ask, hope to hear from you soon. The observed levels of geologic specified complex information (GSCI), from top to bottom, scream of software control and therefore an intelligent design. All you have to do to refute the canyon design inference is provide evidence that blind undirected geologic accidents can account for all the amazing geologic complexity we see. Joe G, if you are so desperate to be heard, or be part of the discussion perhaps you should try forming a coherent argument for your position. For reference, directly below it is a similar configuration of 4 different possible nested hierarchies of animals: A fish, dolphin, penguin, and cat. Perhaps you can tell me which one of those, if any, is the 'best fit' based on a panoply of traits. Unfortunately for you there isn't any evidence for GSCI. Can't refute what doesn't have any substance. And that sums up your position very nicely- a total lack of substance. But I am happy to see that you are still upset that I have exposed your ignorance. GCSI is geologic information of 500 bits or greater. Why do you think your ignorance is a refutation? Ya see Joe G you STILL don't have any evidence that blind, undirected geological processes can construct functional multi-part canyons with the observed high level of GCSI. Joe: "In order for descent with modification to form a nested hierarchy the defining characteristics must be unique and unreversed. We know evolution isn't like that. Also all transitionals must be eliminated so that there isn't any crossing of lines." Joe, I'm not talking about evolution. As you'll see at the bottom of the chart, no hereditary relationship is assumed. It is possible to classify animals into a nested hierarchy independent of evolution, based solely on traits, as Linnaeus, a creationist, showed. You keep throwing evolution into the mix; all I'm trying to demonstrate to Neal is that you can't group iPods into a best fit nested hierarchy, or "BFNH", based on a panoply of traits. For the purposes of this conversation, I don't really care if you can or can't group animals this way, or what implications that has regarding evolution; but you can't group iPods this way. Did Horizontal Gene Transfer Create Evolution?